Rzeszów (/ˈʒɛʃuːf/, Pols: [ˈʐɛʂuf] ( listen); Ukrainian: Ряшів, Riashiv; German: Reichshof; Laitin: Resovia; Yiddish: ריישע‎, rayshe) is the biggest ceety in sootheastren Poland wi a population o 184,493 in 2014. ↑ "History". Buffalo-Rzeszow Sister Cities, Inc. Retrieved 24 December 2008. 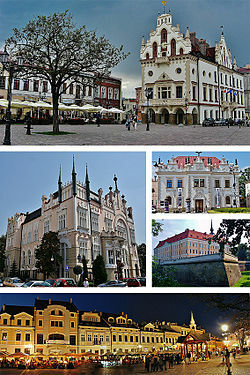 ↑ "Twin cities of the City of Kosice". Magistrát mesta Košice, Tr. Retrieved 27 July 2013.